For the past year i’ve had reoccurring thoughts, how can we make health more accessible? more affordable? more achievable? and then it hit us . . .
but first a back story… if you are a client of mine, you know how passionate I am about herbal medicine and the amazing role it can play on wellbeing and health – however, I am also the first to admit, the liquids don’t always taste ‘delicious’. So, I wanted to create another way to support health without this obstacle. . . . . and that is how this little project was created! 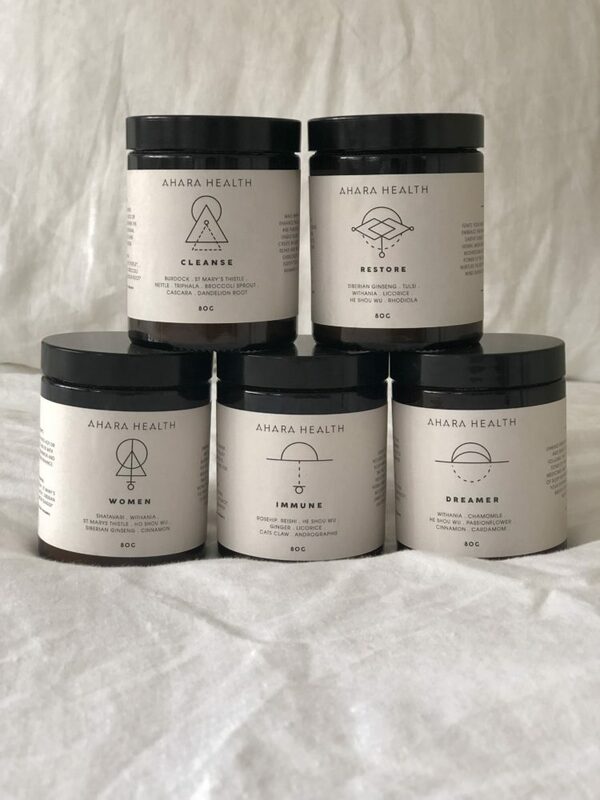 AHARA HEALTH elixir powders. 5 products, naturopathically formulated using western herbal medicine to support different aspects of need. DREAMER : relaxing and adaptogenic herbs to support calm + unfold from the day. Dreamer can be added into nut milk and gently warmed over the stove in the evening, to unwind from the day and encourage sleep. For extra support or calm a busy mind it can be added into smoothies and consumed throughout the day. CLEANSE: enhance detoxification pathways, encourage glowing skin and reset health. Cleanse can be added into fresh veggie juices or for the keen beans, straight up in water. Cleanse aims to stimulate the liver, encourage detoxification pathways and encourage glowing skin. IMMUNE : encourage the natural pathways and enhance the immune response. Immune can be used during times of health unrest, enhanced immune requirement or to support the body during extended times of stress. Add into hot water with a squeeze of lemon juice and enjoy. WOMEN: increase libido, enhance detoxification + supporting adrenal health. This mix is for a superwoman in need. Specifically formulated for female needs, this blend aims to support the adrenal system, encourage energy while encouraging detoxification pathways. cinnamon is added to support blood glucose levels and as a reproductive tonic. Add into smoothies, hot drinks such as coffee and chai or add into raw treats. Each of the blends are a specific combination of herbs and spices to support the body in different times of need. Free from fillers, preservatives and flavours, wheat, soy, dairy, animal products – just pure, simple and Australian Certified Organic ingredients. The 5 powder blends are now in the clinic and may be prescribed as part of your health protocol.